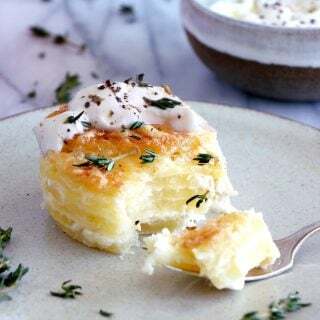 Gratin dauphinois is a traditional French dish made with thinly sliced potatoes, and oozing with creamy and heart-warming flavors. Preheat the oven to 430°F (220°C) and grease the bottom and the sides of a 9-inch (25 cm) gratin dish with butter. Mix together milk and cream in a measuring cup. Set aside. Peel and thinly slice the potatoes. Layer half the potato slices in the dish in an even layer. Season with salt and pepper, and sprinkle some nutmeg over. Add tiny pieces of butter all over, then cover with a thin layer of grated cheese. Add the remaining layer of potato slices. Season with salt, pepper and nutmeg, then pour over the milk-cream mixture not higher than the upper layer of potato slices. Cover with grated cheese. Bake for about 50-60 minutes. The gratin is ready when it is golden-brown in surface and potates are fork tender. Serve warm or lukewarm with a side of lettuce.